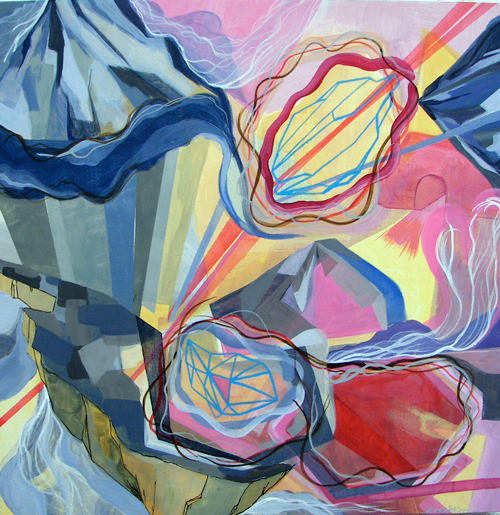 John Williams, Mountain Big Top, acrylic, ink, flashe on panel, Best in Show Absolutely Abstract 2010 @ The Philadelphia Sketch Club. Click the thumb-nail below for a closer look. The selection of ninety-eight art works by jurors David Foss and Michael Gallagher for The Philadelphia Sketch Club’s Absolutely Abstract 2010 exhibit is engaging, exciting and challenging. The range of interpretations runs through almost any media you can think of – Kyle Margiotta‘s, Ribbon, pencil drawing takes basic materials and elevates them to an alternate reality, Rik Viola‘s painting is a triumph in context and Mina Smith-Segal suggests surrealism, impressionism, brutalism, naive primitive-ism…all modern and contemporary styles but stretching the envelop of the popular view of abstraction. 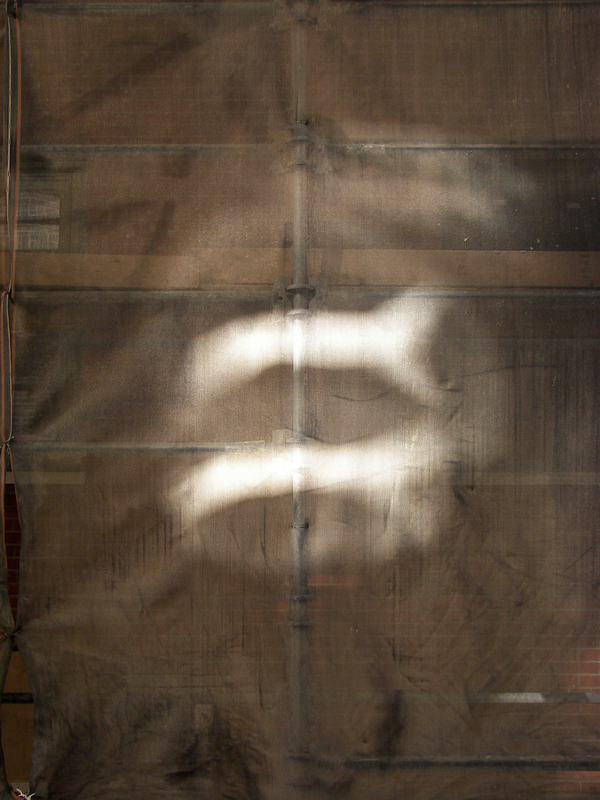 DoN Brewer, light beings (Sid & Nancy), digital photograph, archival ink-jet print, 2008. 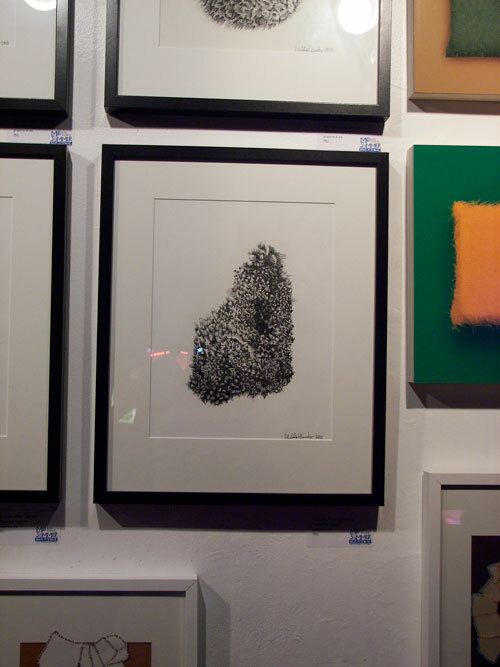 This is the third consecutive year DoN Brewer‘s photographs have been included in the Philadelphia Sketch Club‘s annual Absolutely Abstract show, this year’s piece is named after the tragic punk lovers Sid Vicious & Nancy Spungen who he once saw shopping in Fiorucci’s in NYC in the 70s. 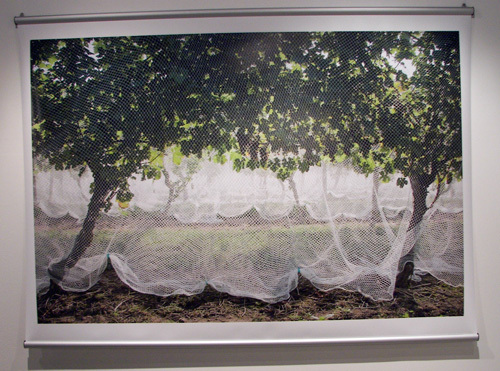 Rodney Miller, Ring Droppings, digital print on canvas. Fall under the spell of the fractal-like inter-twined rings in Miller’s ultra-trippy contemplation on color, shape and depth of field – go see the real thing at The Philadelphia Sketch Club on the Avenue of the Artists, Camac Street in Center City Philadelphia. This entry was posted in Art in Philadelphia, Art Spaces Philadelphia, Collage, Computer Art, DoNBrewer, Drawings, Fine Art Philadelphia, Mixed Media Art, Paintings Philadelphia, Philadelphia, Philadelphia Abstract Art, Philadelphia Art, Philadelphia Art Alliances, Philadelphia Art Clubs, Philadelphia Art Galleries, Philadelphia Art Installations, Philadelphia Art Shows, Philadelphia Artists, Philadelphia Artists, Philadelphia Photographers, Philadelphia Sketch Club, Photography Philadelphia, Uncategorized, Watercolors on August 31, 2010 by admin1. David Foss‘ sculpture made of found materials is like a futuristic robot/humanoid perched in the center of the gallery, the 2012 theme resonates throughout the room with visions of rapture, hell-fire, nothingness and hopefulness. Foss’s sculpture reminds DoN of a futuristic boy transformed by a post-apocalyptic storm into a cyborg forced to find his way through the scorched land with feelers and antennas extended in all directions, the central brain stem in the middle of the body instead of stupidly plopped up on top where any fool could knock it off. David Foss is the director of the Da Vinci Art Alliance and will be having a major show at LGTripp Gallery in Old City in September. This entry was posted in Art in Philadelphia, Art Spaces Philadelphia, Da Vinci Art Alliance, DoNBrewer, Drawings, Fine Art Philadelphia, Mixed Media Art, Philadelphia, Philadelphia Abstract Art, Philadelphia Art, Philadelphia Art Alliances, Philadelphia Art Clubs, Philadelphia Art Galleries, Philadelphia Art Shows, Philadelphia Artists, Philadelphia Artists, Philadelphia Photographers, Plastic Art, Recycled Art, Uncategorized on August 23, 2010 by admin1. 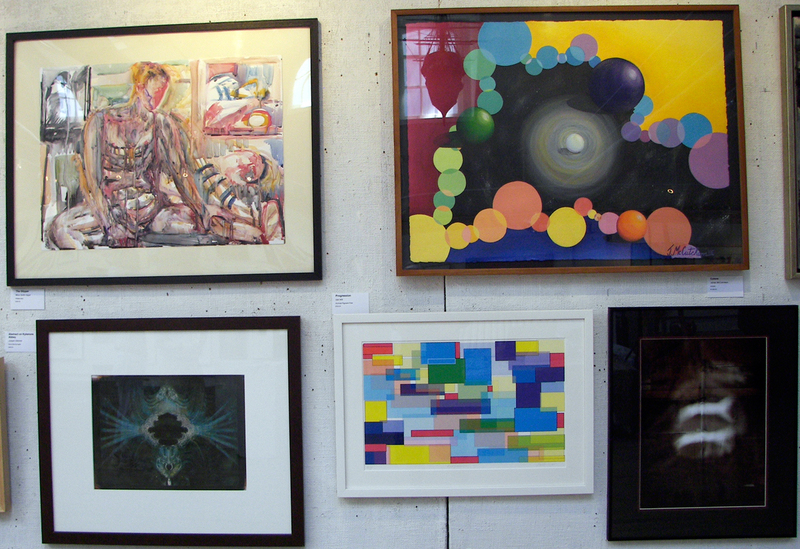 Rich Harrington, fine artist, illustration professor & Philadelphia Sketch Club board member is just one of the local art activists featured in Midsummer Invitational @ Off The Wall Gallery, 13th & Pine Streets. Harrington’s paintings of rusting hulks of old cars and trucks are indefineable: part landscape, part still life and part portrait, the paintings are loaded with secret narratives and unanswered questions. Harrington is a driving force@ PSC, always prepared to problem solve, take on projects and promote other artists – just ask his students, they love him. 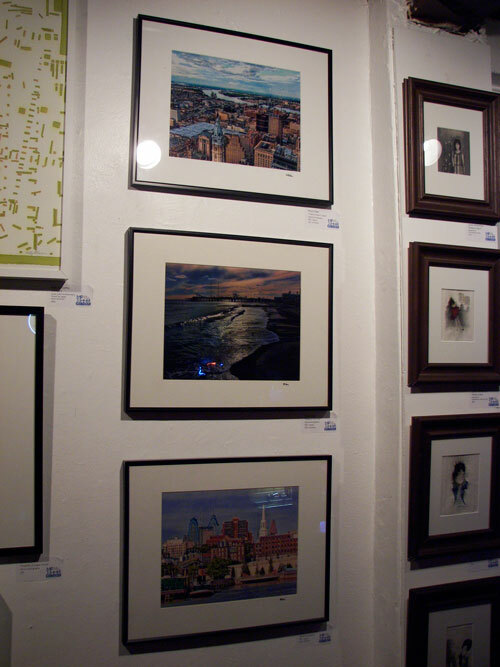 Morris Klein is VP of the Photographic Society of Philadelphia and organizes ongoing art show at the Bonte Cafes in Center City, his style of photography is hyper-realistic with enhanced color and edges. Getting photographers to participate in ongoing events is like herding cats, Morris is always even keeled and fair without being condescending – guys like Morris make such clubs like PSoP last hundreds of years. 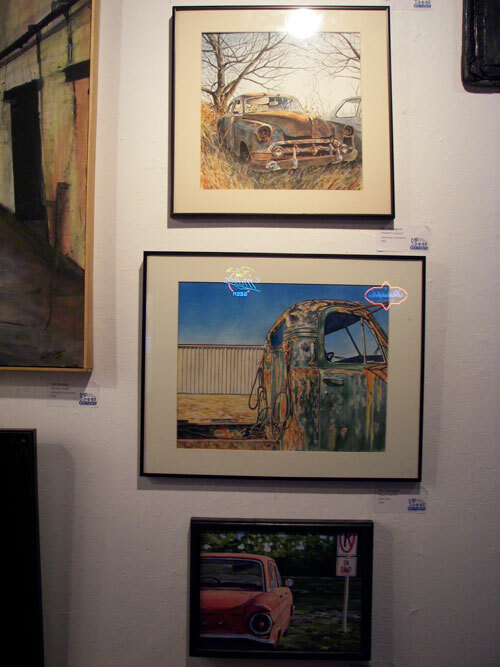 Michelle Anne Clements @ Off the Wall in Dirty Franks – curator & gallerist Jody told DoN that Clements is donating a portion of the proceeds of her drawings of coral to Gulf relief. The alien forms are wonderfully rendered drawings of different kinds of corals, the simple black and white drawings, beautifully presented, pay homage to the complexity of the simple and vital life form. The Midsummer Invitational @ Off the Wall Gallery includes: Michelle Anne Clements, Rebecca Cross. Rich Harrington, Morris Klein, Kelly A. Kozma, Don McPartland, Karen Rodewald, Peter Smyth, Michael B. Tantaros & Lauren Westenhiser through October. This entry was posted in Animal Art, Art in Philadelphia, Art Spaces Philadelphia, Dirty Franks, Drawings, Fine Art Philadelphia, Mixed Media Art, Multimedia Art, Off the Wall Gallery, Paintings Philadelphia, Pastels, Philadelphia, Philadelphia Abstract Art, Philadelphia Art, Philadelphia Art Clubs, Philadelphia Art Galleries, Philadelphia Art Installations, Philadelphia Art Shows, Philadelphia Artists, Philadelphia Artists, Philadelphia Photographers, Photographic Society of Philadelphia, Photography Philadelphia, Uncategorized, Watercolors on August 22, 2010 by admin1. Photo by Timothy J. Moersh. Model Meredith Battite of ExploreTalent embodied the spirit of International Superstar Leon Rainbow‘s genius black light art show in the dark back room of Smile Gallery. The intense blue light is projected across the room with two big projectors and a Dan Flavin-like florescent mounted on the wall – the paintings vibrate with day glo color and bikini girl Meredith time tripping right out of Laugh In like a Goldie Hawn for the modern age. The similarities between then & now are nostalgic yet with a grok of how the futuristic 60’s was like while we fought the American War in Viet Nam compared to the exit this morning from Iraq – it’s a party @ ground zero, baby. 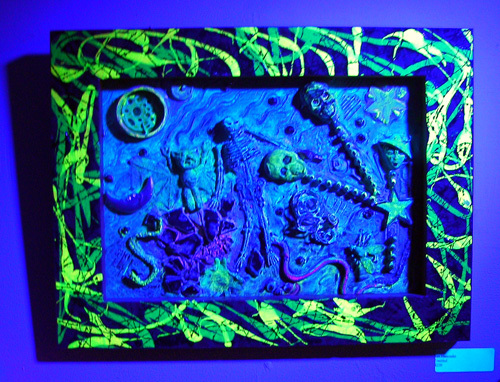 Jim Hancocks, Untitled, mixed media & black light in the back room @ Smile Gallery. Artists in the show include Leon Rainbow, Mike Ciccotello, Joe Iurato, Josi Luv 1, Aja Washington, Jim Hancocks, Papermonster, Dave Orantes, Demer, Kortez, Jon Connor & Will Kasso. Super-Kawaii!! 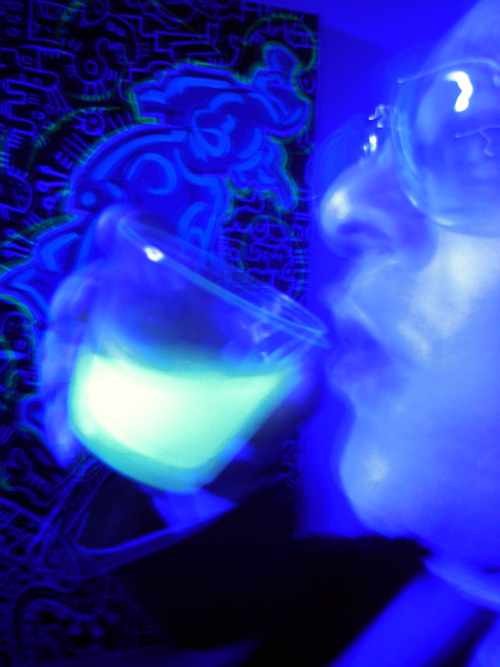 Bangkok & Black Light @ Smile not only stirred memories of the 60’s, in the trippy vibrant glow, dreams of absinthe drinkers and green fairies emerged from the purple haze. is using light in a completely different way, reflecting the ambient light off metal, embelleshed, hammered, painted and polished into ethereal worlds all unto themselves, each one gives a different feedback experience as you move about the gallery. 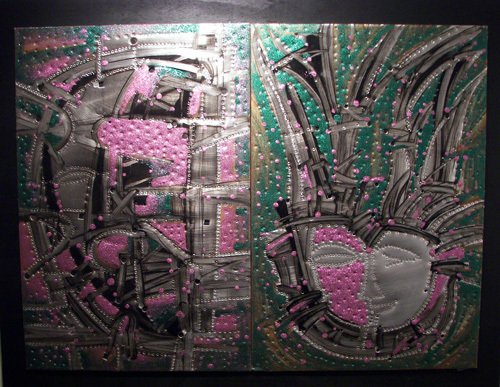 The collision of hard edge metal reflections and the zany black light art creates a dynamic inversion of perception & reality like a Star Trek holo-lab. Vichoke Mujdamanee, Philadelphia, mixed media @ Smile Gallery on 22nd Street near Chestnut. 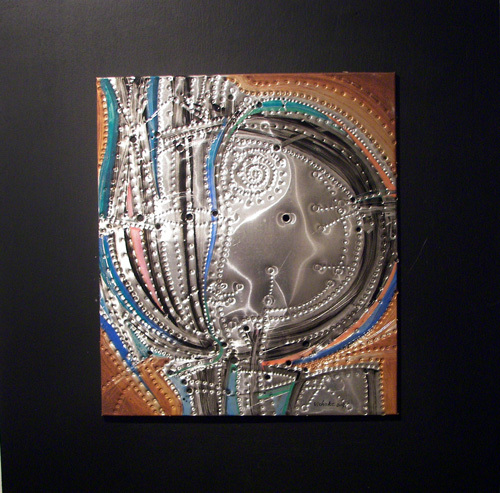 This entry was posted in Art in Philadelphia, Art Spaces Philadelphia, Collage, Da Vinci Art Alliance, Fine Art Philadelphia, Light, Mixed Media Art, Multimedia Art, Paintings Philadelphia, Philadelphia, Philadelphia Abstract Art, Philadelphia Art, Philadelphia Art Galleries, Philadelphia Art Installations, Philadelphia Art Shows, Philadelphia Artists, Philadelphia Artists, Philadelphia Pop Art, Philadelphia Sculpture, Uncategorized on August 19, 2010 by admin1. 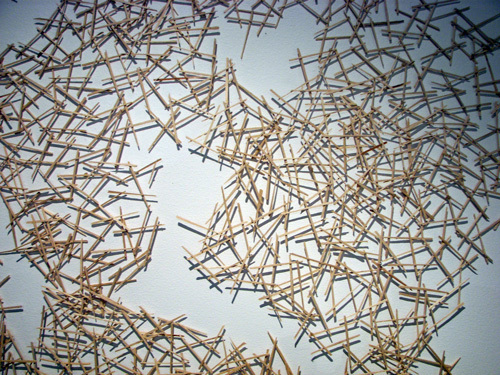 Susan Benarcik installed thousands of toothpicks on the walls of the CFEVA Gallery @ 15th & Locust Streets as part of Sculpting Nature, a three person show of CFEVA Career Development Program Fellows . Benarcik’s wooden installation wraps around a corner paired with hanging tear-drop shaped sculptures made from white wire hangers, some of which were rusted from hanging in a private garden (hmm…do the initials E.T. come to mind?). 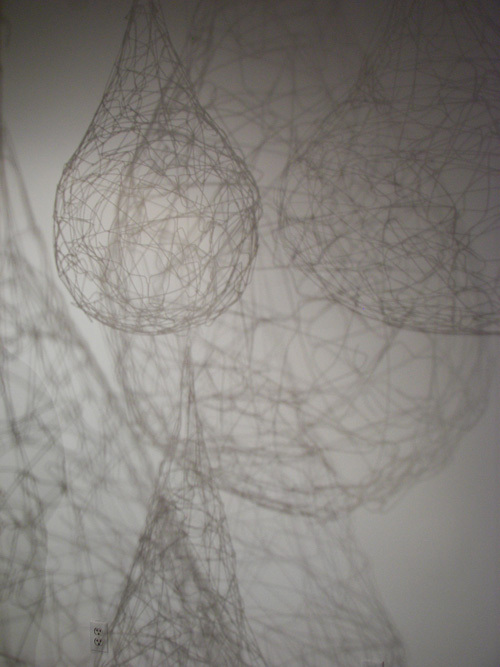 Susan Benarcik’s wire sculptures are light and airy yet angsty and filled with emotion casting shadows of doubt in the gallery’s alcove. 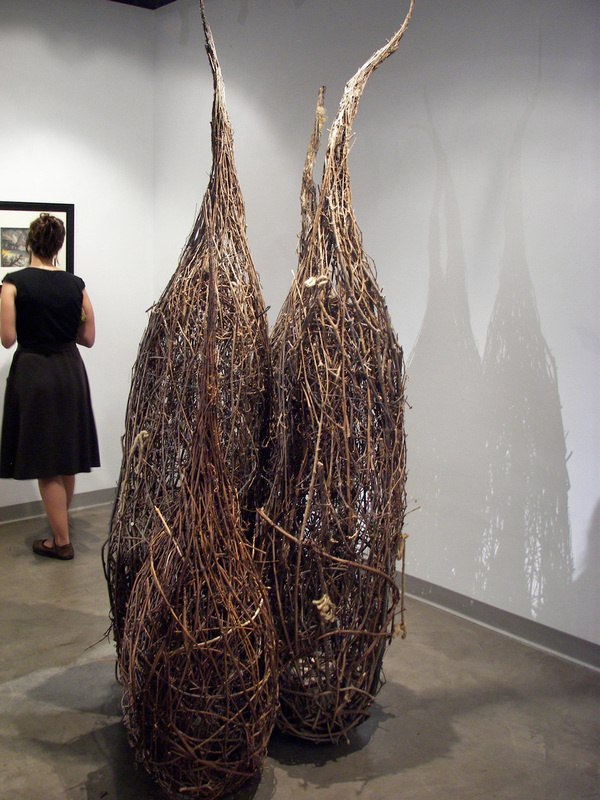 Susan Benarcik @ Sculpting Nature. 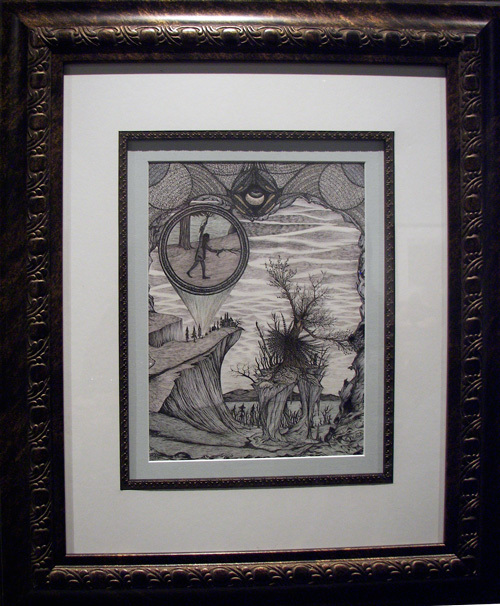 R. Noel Shaak‘s pen, ink & marker drawings are goth & Goethe mash-ups each telling an entire movies worth of narrative like some steam-punk Gorey for 2010. 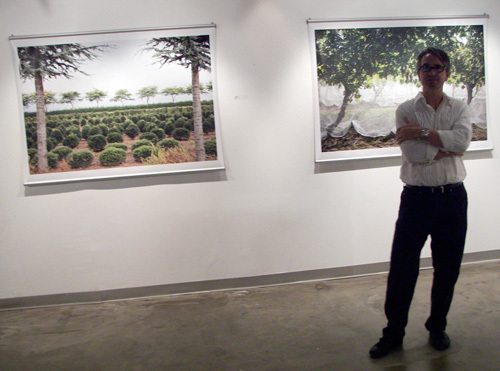 John Woodin talked about how his vineyard photos are actually Long Island and not some exotic European country. The large scale photographs have a strange geometry, formal compositions drawn from informal resources like walking through a warm East Coast forest in summer. DoN knew the photos were Woodin before he knew they were Woodin, that’s style. The cohesive show is an amalgam of styles each somehow tuned into the concept of nature changed by the gaze of people, Benarcik’s sculptures energize the room, Shaak’s drawings whisper weird secrets and Woodin’s photos traverse space and time. 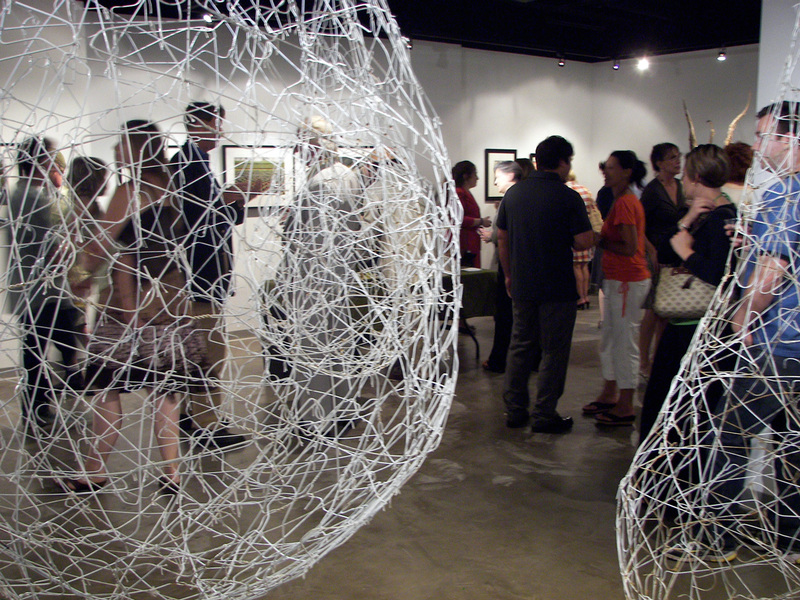 John Woodin @ Sculpting Nature in the Center for Emerging Visual Artists Gallery through 9/2/2010. This entry was posted in Art in Philadelphia, Art Spaces Philadelphia, Center for Emerging Visual Artists, Design, Drawings, Fine Art Philadelphia, Illustration, Mixed Media Art, Paintings Philadelphia, Philadelphia, Philadelphia Abstract Art, Philadelphia Art, Philadelphia Art Galleries, Philadelphia Art Shows, Philadelphia Artists, Philadelphia Artists, Philadelphia Photographers, Philadelphia Sculpture, Uncategorized on August 18, 2010 by admin1.